St. Patrick's Day is coming! 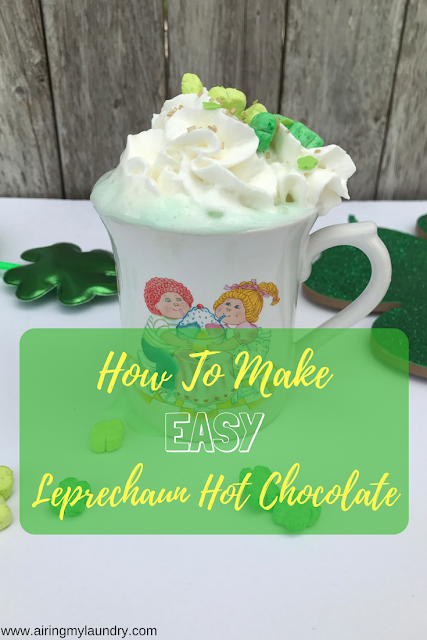 To make it an extra fun day, you can make Leprechaun Hot Chocolate. Remember how I made Easy Unicorn Hot Chocolate? Well, this is basically the same thing. Only, you know, green. 1. Heat your water. Or your milk. We usually do water to save on calories. It's not as tasty though, I'll admit that. Add the white hot chocolate mix. Stir. 2. Add the green dye. Stir. 3. Put a bunch of whipped cream on top! 4. Add marshmallows and sprinkles. It's such an easy drink to make with kids. Or hey, for yourself, because adults can have green hot chocolate too. Oh and yes, that's my Cabbage Patch mug from when I was a kid. Do you do anything for St. Patrick's Day? Sounds like a tasty snack & easy to make! This is such a cute treat to have with kids. I see a lot of possibilities using this as a base recipe for different events and holidays. Yes! You can change the color for any holiday. Super easy. Sounds super delicious. I have a sweet tooth, i think i would enjoy this more than the kids!!! Oh very cool! I love that you still have your cabbage patch kids mug, that is awesome! What an awesome idea! I'd love to make the adult version of this adding a little Bailey's Cream. That is so cute! I think this is the festival that we don't celebrate here in Manila. Maybe because there are only few Irish people here. We got the same Lucky Charms yesterday - the special St. Patrick's Day box? LOVE them! Green food never appealed to me--TILL NOW! Oh. My. Word! I must make this. I love this - it's such a cute idea! I love that you have your childhood mug too. That's the coolest. I think that's so cute, I'll definitely have to do this. Oh my gosh. This looks delicious. I'm going to have to make this for myself now. Ok... I guess I'll make it for the kiddos and hubs too. And thanks for the recipe for LEPRECHAUN HOT CHOCOLATE. My boys would love this drink. Love how the Lucky Charms looks on the drink. This is such a fun idea for St. Patrick's Day! I'm definitely going to have to make this for my little sister this month. Yummy and so perfect for St. Patrick's Day! As an 80s kid, I have to mention how much I love your Cabbage Patch mug too. This looks so fun to make with the kiddos. Perfect to make for St. Patricks Day as well. Oh, I've got to do this for my kids on St. Patrick's Day! I usually don't do anything, I know lame. lol But this is easy enough for me to actually try! This is the most amazing St. Patrick's day thing I've seen. A definite must for the holiday. Any child would enjoy this drink! It is so colorful and the best is that it is made with chocolate and topped with whipped cream. So delicious! This hot chocolate looks amazing. My kids would think that this was so much fun. I love the cup! This hot chocolate looks easy and fun to make. I will have to try it out with my son this weekend! 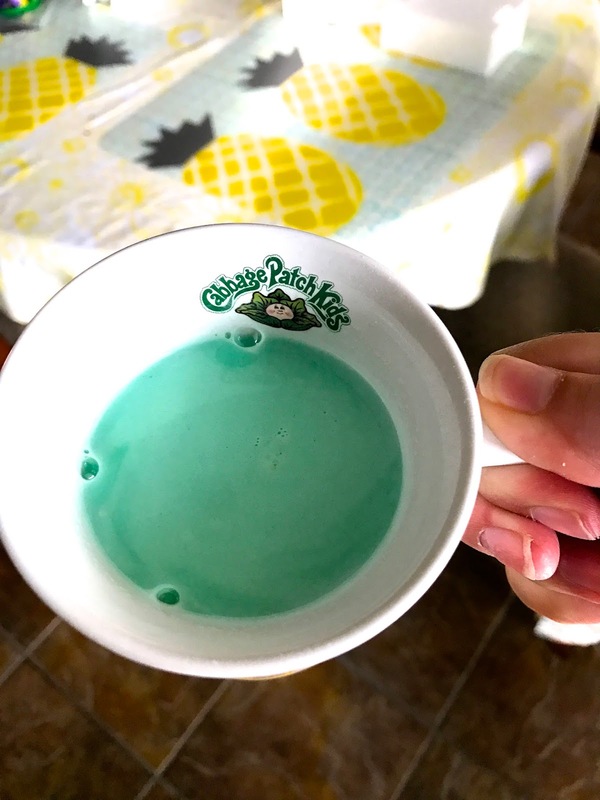 We don't celebrate St. Patricks Day here in my country Philippines, but I do love this fantastic recipe! I don't do anything fo rSt. Patricks Day anymore. When I was younger we would celebrate by going out and getting Irish food and pretty much drinking anything green that we could find. Oh my goodness that is so cute. Now that my grand kids are getting older, I love finding these like this recipe to make them for St. Patty's Day. That's such a cute idea! Did it stain your teeth at all? Nope! My daughter and I had some and I didn't notice any teeth staining. Your Leprechaun Hot Chocolate looks divine and the whipped cream, marshmallows and sprinkles looks totally divine on it! Can't believe that your Cabbage Patch mug is still there! My kids love hot chocolate. We have already decorated for St Pattys. We usually do the traditional dinner - corned beef, cabbage, potatoes. I throw green food coloring in just about anything I can. It looks so decadent. I think it's a great way to get kids excited about St. Patty's day! It's so adorable. I love how easy these are to make, they're definitely going to be a hit with my kids. I wouldn't mind using milk for the kids, water's for me though! Looks easy to do! Unfortunately here we don't celebrate St.Patrick's Day, would want to get a chance to celebrate it though. I love how easy yet festive this is! What a great and tasty craft for the kids. You are very creative. I would have never thought of this and I bet it taste yummy. We don't celebrate St. Patrick's Day from where I live. But I would certainly like to have a sip of this! Ahhh that looks so fun and such a great activity to do with the kids! Definitely going to look into doing this. Pardon my language but personally, green hot chocolate is such a mindf*ck. Close my eyes and tastes like chocolate, open my eyes and it's... green. Hmm... 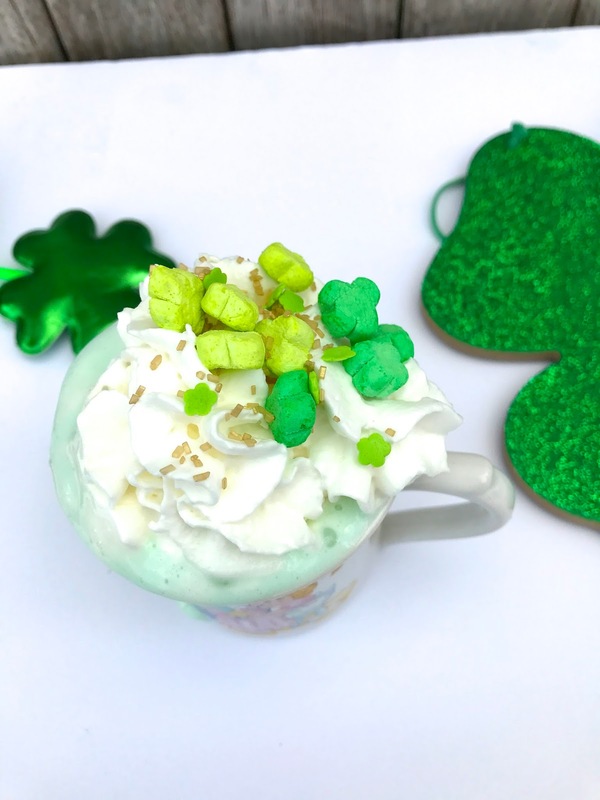 But, whipped cream + green shamrocks from Lucky Charms = Ace! What an interesting beverage. It is perfect for kids and kids-at-heart. This is adorable and perfect for St Paddy's Day. I'll be making and sharing this with te grandkids when they come over! Ahhh I'm obsessed with that vintage (or maybe not vintage?) Cabbage Patch kids mug! I live in Chicago and the city always goes all out for St. Paddy's day. I love going downtown for the annual river dying each year. This is such a fun idea! My boys will love this. I can't wait to make them some on St. Patrick's Day! This would be fun to make for the grandkids. Can see the surprise on their faces. Next cup I would let them help make. This came out looking adorable and delicious! This would be really fun to make with my daughter! She would love it! What a creative idea for St. Patrick's Day! Great way to make your regular hot chocolate all that more enjoyable! This is such a cute idea! My daughter would go crazy for this stuff! This looks like fun. Our girls love hot chocolate. I might give this one a try. Things like this make me miss those days when my kids were still little! I can't wait for my grandson to be old enough to have treats like this. I am sure going to have fun making it for him. This looks so good, my son would love to have this drink. Super fun! My kids would love this! This post also reminded me to get our my St. Patricks banner. It's almost here! This is absolutely amazing! I think my kids are going to love this! What a fun drink. We usually prepare corned beef and cabbage and wearing something green. No pinches wanted. That is a really cute recipe! I bet the kids love it. I love the St Patties day recipes. This one is so cute! First I have to comment on how awesome your Cabbage Patch Kids mug is!! **love** We love hot chocolate, like all the time, this looks like a lot of fun for March! 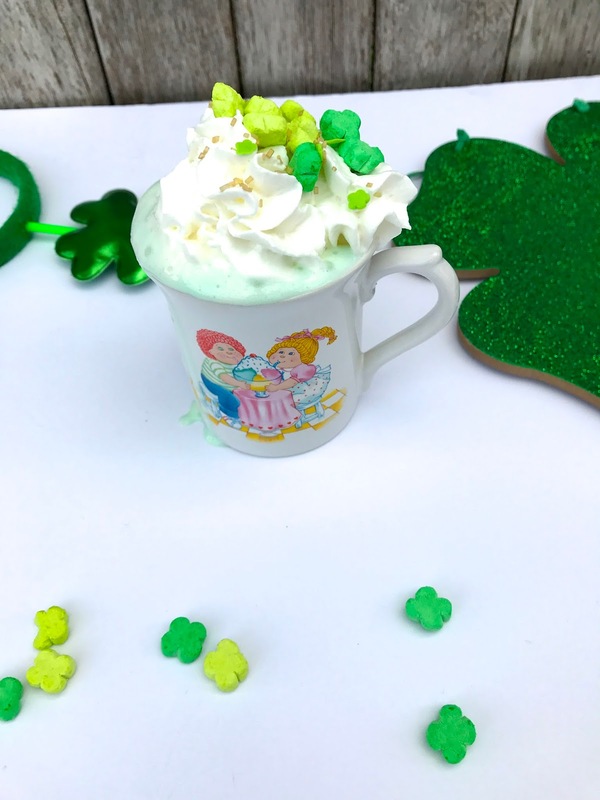 I love hot chocolate and making a St. Patty's themed one is perfect for the occasion. I think this one's a must try! It looks SO good! OMGosh, my boys will love this. They would not however appreciate your Cabbage Patch Kid cup to the same level I do - bravo! Oh wow this is a fun drink! I bet my kids would love the fun, festive color of this. HOt chocolate is always popular around here!! Oh, that looks like such a fun drink for St. Patrick's Day! Great idea. My kids would love the Lucky Charms marshmallows on top. This looks so tasty! I bet my boys would have fun making and drinking this! We don't celebrate the holiday, but I know my kids would love this! Maybe we'll make it this year for kicks! Hot chocolate is so comforting! I love that this one's perfect for St. Patrick's Day, it's also easy to make which is a winner for me! Talk about a drink that my kids will enjoy! I think it's awesome and it's really creative too. I love that you used white hot chocolate. Seriously wouldn't mind making this just to treat myself! It looks so good and it's decadent too. The perfect drink! Love the mug! Soooo cute!We got the same Lucky Charms, my son loves it! I can't wait to make your drink! I saw a photo of leprechaun hot chocolate on instagram and was wondering how you make it so thank you! Definitely giving it a try. What a cute and clever idea! My daughter loves hot chocolate. I am going to have to make this for her. I grew up on cabbage patch kids. I love the mug this is amazing recipe! I love hot chocolate, and my little one loves Warm chocolate. I know she would get a kick out of having Leprechaun warm chocolate. Oh this looks so yummy and perfect for kids. This looks so yummy and cute at the same time. I wanna make this so much!! Oh boy, I saw the title and thought "I'm so gonna love this post" Haha This look so cute and delicious. Want to try it! At the most basic level, I have to first say "Thank you" for reminding me that there is a holiday this month. If you look at the store, it's Valentine's Day and then Easter. Great ideas! My daughters will love this so much. It has a beautiful color and looks delicious, I have to try it absolutely! I don't think I will o anything special for St Patrick's day, but this hot chocolate sounds as nice treat for my husband. I am the hot chocolate fan around our house. So on St Patrick Day or before and after I will make me some green hot chocolate just for myself. It's so cold today here in the south and I don't think I can wait until St. Patrick's Day. LOL I need this now! Yum! This would totally hit the spot today! It's cold outside and something like this would be perfect! YUM! CUTE! This would totally hit the spot today, I am FREEZING and need to warm up! We don't tend to do anything for St Patrick' Day although this would be something I'm sure my children would love to try. I've not tried them with white hot choc yet. Girl, I just want that mug! Being a child of the 80's, I LOVE it! But the hot chocolate sounds awesome, too! This would be a fun group treat for St. Patrick's Day. I will have to share it with a friend that I know. It would be so good! My boys would love this drink. They do love hot chocolate and this would be a great treat for them. This looks like a lot of fun to make. I typically don't do anything on St. Patricks day. Where do I find white hot chocolate mix? My kiddo will enjoy this fun treat for the holiday. Okay, so will I! This is delicious, super fun to make and perfect for St. Patrick's Day. Thank you so so much. Green hot chocolate sounds fun! The local dairy sells green mint milk around here for St Patrick's Day, but I've never tried it. This sounds like a fun holiday drink. I have never been much for celebrating St. Patrick's Day but this looks cute enough that I just might. What a fun idea! I'll have to make this for my kids, I know they would get a kick out of it. We don't usually do much for St. Patrick's Day but this is a cute idea. Oh my goodness! I want a mug of this deliciousness right now! This is the perfect beverage for St. Patrick's Day and any cool-weather night. Yum. Yum! we dont celebrate this day here but i always loved watching people making different things. this cup cake looks drool worthy! You know I am going to try this! I love making special treats like this just for me! THis is so interesting recipe and the best thing on this children will gonna be loved this and they can make it too. Honestly, I am not familiar with the recipe of Leprechaun Hot Chocolate but it looks really delicious and I am so excite to make this for my kids. Thanks for sharing! When it comes to chocolate, I've never considered a color that isn't brown before but I would love to try it now. It just looks so yummy. I mean, who never loves some goof hot chocolate? Oh wow, this looks yummy. The recipe is also so easy. My kids would love that! What a fun idea. I forgot that there is such a thing a white hot chocolate. Now the possibilities for dying it different colors are endless! This looks delish! And I've never actually tried white hot chocolate before. I need to make this with my kids! I am so making it for St. Paddy's this year! Thanks for recipe looks ideal to me! This is such a sweet delight. It looks perfect on St.Patrick's day. I am sure kids will love it. I was seriously just drooling over hot chocolate. This sounds like perfection right now. Green is my favorite color too! My daughters will love a green hot chocolate! Thanks for sharing this recipe. It's my first time to see this kind of recipe and it really pops out easily coz of the green color!! It looks so fun! I love hot chocolate and having this twist will make me love it even more!